Once a year the members of Les Dames d’Aspen hold a gala cocktail party, dinner and dance. This year it was held at the Castle Rim home of Susan Horsey. For more than 20 years Les Dames has raised funds for the arts solely through volunteer positions. Four years ago, a very weary board of directors wanted to disband the organization. However, Christine Aubale Gerschel, who founded the group in 1983, refused to give up and restructured the organization so there are now more than 115 members. Each member gives $1,000 annually (instead of putting on a grand party to raise funds). Because the organization is growing and taking more and more of Christine’s time and energy, the executive board decided she should be a paid executive director. She will also remain a paying trustee. Over the years Les Dames has raised more than $2.1 million for local arts organizations. 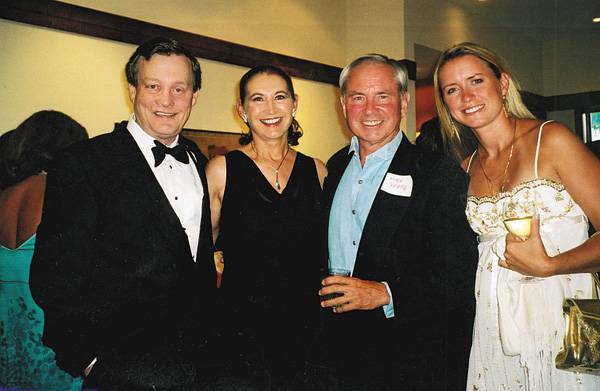 Of the first $100,000 raised each year, 80 percent goes to Aspen Santa Fe Ballet, four scholarships of $2,000 each go to art students in the Aspen/Basalt schools, the remaining funds are divided between the Aspen Writers’ Foundation and Theatre Aspen, formerly Aspen Theatre in the Park. In the event that Les Dames can distribute more than $100,000, a maximum of $5,000 each will be donated to the Aspen Music Festival and Jazz Aspen Snowmass.The Aspen Historical Society last week elected the following officers for the board of trustees for the next year: Jackie Kasabach, president; Dwayne Romero, vice president; Ken Hammerle and Gail Nichols, treasurers. Junee Kirk hosted a cocktail buffet and reception this week at her home featuring recent transparent watercolors that she painted in the Lake District of England and the Aeolians Islands of Sicily. Local chef Barclay Dodge will be reopening his Aspen restaurant only with a different name and different menu … what was his Restaurant Mogador will now be Restaurant Barclay, in the same location. Alain Azizi will be restaurant manager. The menu will feature modern American cuisine, such as wild salmon with black truffles and suckling pork confit. The restaurant will open Dec. 9. There are so many events scheduled for the holidays. From Dec. 2-4, the ninth annual festival of handmade gifts by local artists will be held at the Wyly Community Arts Center at 255 Gold Rivers Court in Basalt.The Aspen Art Museum will hold its annual Freestyle on Wednesday, Dec. 28, at the St. Regis hotel. Featured will be Dennis Basso’s winter collection, Bulgari jewels and Aspen magazine. For reservations, call 925-8050.The Aspen Camp School for the Deaf will hold its annual fund-raiser, “An Evening at the Crystal Palace,” on Thursday, Dec. 8, starting at 6 p.m. Invitations are in the mail.To provide everything people need to know about working in Aspen this winter, the Aspen Chamber Resort Association will hold “Aspen 101” on Thursday, Dec. 1, at The Gant at 610 S. West End St. To register, call the ACRA at 925-1940. Shae Singer is planning a holiday open house on Saturday, Dec. 3, at her Sashae Floral Arts and gift shop from noon to 6 p.m.A new horse magazine called “Horse Connection” came out with its first issue in November 2005, and the Roaring Fork Hounds Hunt was featured in an article and the cover photo.Undercurrent … You can hardly wish your friends “good morning” anymore when you meet them on the sidewalk … because they are busy talking on their cell phones.